Workplace and academic approved CPR “C” and AED is available via Halifax First Aid. CPR “C” teaches students cardiopulmonary resuscitation and automated external defibrillator (AED) techniques for victims of every age group. Students will also learn how to perform cardiopulmonary resuscitation with sufferers experiencing additional complications along with the use of AED’s. All of the participants which fully pass this class get a workplace approved CPR level “C” award that meets a number of different accreditation requirements. Scroll to the bottom within this page to enroll for any CPR “C” class that suits your timetable. This program is made for cardiopulmonary resuscitation accreditation only, no first aid certification is included in the certificate. Enroll right now to acquire the best education at the cheapest rates in Halifax. The length of CPR “C” depends on the level of skill, capacity and education speed of the individuals in the class. Traditionally the program varies from five to 6 hours. At Halifax First Aid we are proudly dedicated to the best rates. This program will cost you a flat fee of — dollars. Payment can be accomplished online via the enrollment process below. Candidates enrolled in this class will learn cardiopulmonary resuscitation tactics for children, adults and infants. Students will also learn about simple cardiovascular system emergencies, legal elements of engaging in CPR and basic specifics of the emergency medical system. To register for a CPR level “C” class in Halifax choose the class starting time and date from the options directly below. Fill out the registration pages and complete the payment to ensure a place in the lesson. Spots are limited. If you’ve got any queries or issues please feel free to contact us via phone or email. Almost all candidates finish the CPR “C” and AED program with no trouble. Upon completion students will get a workplace approved CPR “C” award which satisfies a variety of certification requirements and conditions. All awards are current for 36 months. 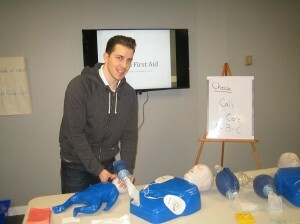 Halifax First Aid also has CPR “C” re-certification classes. To schedule a private group or personal lesson visit our “contact us” page.